Here is the speech I gave at the opening of the new library in Napranum, a library named after the Elder Maryann Coconut. Today, we are here in gratitude for this wonderful event in the history of the people of Napranum. Today, we are here to join in the spirit of celebration. Today, we are here to honour Maryann Coconut. My name is Annalise Jennings and l have the honour of saying a few words about Maryann, her achievements and her great spirit for humanity. Maryann’s parents were Cyril and ‘I’na Hall. Her country is Luwang from her father’s side and Kwokkunum from her mother’s side. Maryann is the eldest of her siblings. Born in 1943. Maryann lived in the girls dormitory from the tender age of 5 and attended the Weipa Mission School. From a young age, she excelled in the Arts and received a highly commended award for the Queensland Art competition in 1952… (Hold up the article) You’ve been making headlines for a long time! She became a teacher’s aid in 1957 and continued to take an active interest in eduction completing a Bachelor of Community Management from Macquarrie University in 2009. In 1963, she married Jerry Coconut. They had seven children. Maryann has ten grandchildren and nine great grandchildren. She studied Theology in the NT and is a committed Christian. What strikes me about Maryann’s values on Christianity… is that she doesn’t just talk it…. she lives it. Maryann… you are a woman of grace… of presence. In fact, when Maryann walks into a room she doesn’t need to speak to be heard. There are very few people on this earth who have that presence and alignment of mind, body and soul. She is a long-term and active member of the WCCCA coordinating committee. Maryann is passionate about her traditional culture and worked closely with her cousin Dr Thancoupie Fletcher and Thanikwithi families to contribute to a dictionary of her Thanikwithi language published in 2007. I met Maryann in 2011 when the Napranum council engaged me to work with the people to establish our community-owned visionary plan. From the outset, my conversation about community ownership and self determination struck a cord with Maryann. The fundamentals of engagement ownership and responsibility for change became deeply embedded in our approaches to create a Whole of Community response to economic sustainability and spiritual wellbeing. In particular, we created a new conversation in the community about shifting our thoughts from negativity to hope and possibility. Where everyone has a voice… where everyone’s contribution is valued. Maryann championed this work and soon became my rock of support within the community. In fact, Maryann showed up to every stage of the Whole of Community Change process. I wasn’t surprised to see her at the strategy workshop when we formulated our community plan back in Nov 2011… but she then turned up to all the empowerment programs , including parenting, the young adults program, and even the student careerlife coaching program. Maryann was determined to have a presence and show her support. Maryann even turned up to a TED talk that l delivered at JCU in Cairns late last year. As the visionary plan for Napranum began to take shape, Maryann became the person l could create and explore with during times of innovation… laugh with during times of joy and cry with through unexpected challenges. She reminded me that life is like a rose… and along the stem there are many thorns, but we must never lose sight of the rose at the end of the stem. And so the plan continued to evolve and here we are today at the opening of the library… another tick off the Napranum visionary plan. Congratulation to you Maryann, and to the people of Napranum whose determination for a sustainable community… now stands the test of time. 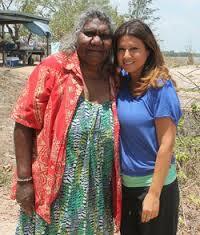 In 2013, Maryann along with 17 other Napranum women came with me to Mungallli Falls for our Women of Worth program. Three days of self-discovery… and asking ourselves those age old questions… Who Am l and What Do I Stand For? Something touched me really deeply during that program. When Maryann said to me, “Annalise, we wanted to buy you a gift, but we didn’t know what to get you. So our gift to you today is a song.” And she and the ladies sang to me in language. I don’t recall the words, but l do remember how l felt at my core… you touched me deeply. Maryann’s phone calls always came to me at times when I needed to hear her divine spiritual knowing. Maryann called me one afternoon at home early last year. She said, “Annalise, I’ve been thinking about you!” She had made the decision that l would be an adopted daughter of her tribal land. She blessed me with the aboriginal language name of Kili… Kili represents the Lorikeet totem. I later learned that the lorikeet symbolises the bridge between the human and the Divine…. the messenger between heaven and earth. This is an honour that l hold close to my heart. The catfish reminds us that we continually enter periods of emotional learning and self discovery. That we must keep an open mind, accept life lessons as they come. It symbolises the capacity to grow emotionally and spiritually and to learn. Amonanja… this is so true of you. You are a symbol of unconditional love and acceptance. You are a source of creative imagination with the ability to awaken within us our own flights of magic and divinity. You are a reminder of that invisible strength that lives within each of us. For me, Amomanja… You are my mother angel. You are my teacher. For me… you represent the potential of the human spirit. And l feel humbled and blessed that you have accepted me as one of your own.